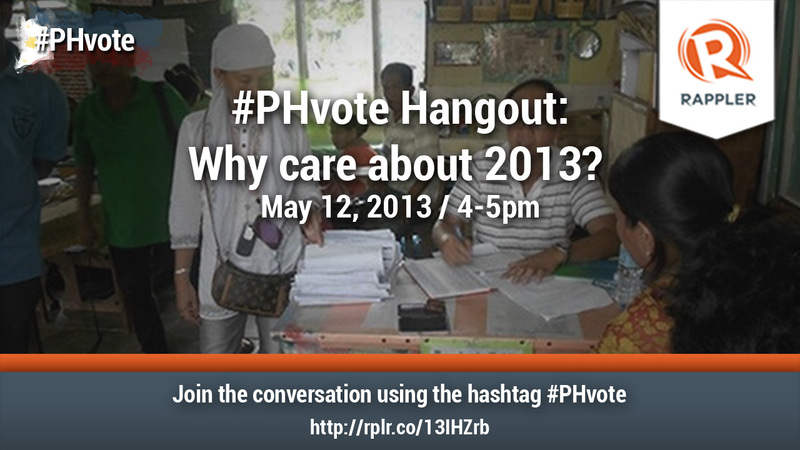 #PHvote Hangout: Why care about 2013? MANILA, Philippines - One day before d-day, we talk about what it means to vote this year. Rappler multimedia reporter Natashya Gutierrez and youth voters sound off during this Google Hangout on May 12, from 4-5pm. Should you care about the 2013 mid-term elections? How will the results of this elections define the second half of President Noynoy Aquino's administration? How important is this election and what role will it play as we move towards the 2016 presidential polls? Rappler social media producer Bea Cupin moderates this Hangout. Bookmark this page for easy access. Click here if you want your voice to be heard during the Hangout. The Hangout will also be part of Rappler's marathon coverage of the 2013 elections. You can also join the conversation on Twitter using the hashtag #PHvote. Follow @rapplerdotcom on Twitter, like our Facebook page and add us to your Google+ circles.